(CelebrityAccess MediaWire) – Two demolition workers were injured when part of the shell at the Constellation Brands – Marvin Sands Performing Arts Center, formerly the Finger Lakes PAC, collapsed last week. The two workers were injured while escaping five or six falling 50-foot steel beams. They were not struck directly by the beams. “They were running off stage while [the beams] were falling,” Sgt. Tate Colburn of the Ontario County Sheriff’s Department told the Finger Lakes Times. The workers were preparing to dismantle part of the old concert shell as part of a $13 million renovation when the accident happened. 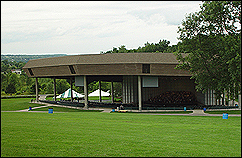 The Canandaigua, New York, amphitheater is being replaced with a larger, state-of-the-art facility.